Learn to add your own image to your course cover to match your desired brand and motivate your students. Including beautiful course cover art can inspire your learners to learn about the topic you are teaching, just as a beautiful school campus can encourage learning. 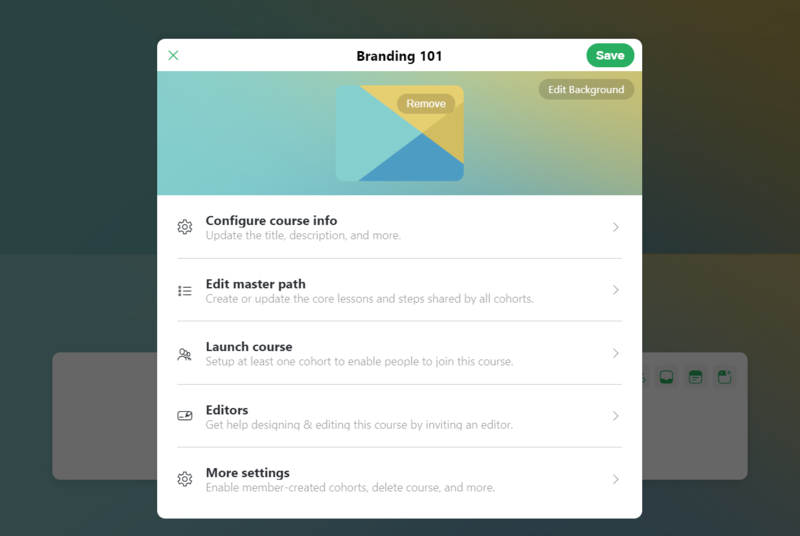 Your course covers and Path design can also be a reflection of your brand. Course covers appear at a variety of sizes depending on context. It’ll help to select images or artwork that works well both large and small. You’ll upload your images as .PNG, .JPG, or .GIF but do not include any transparent backgrounds. .JPG images are recommended for most images. The course cover will blur to produce an atmospheric background behind the course path. You can edit this default background if needed. Go to your Course Settings, which can be accessed by opening the course and selecting Settings directly under the course title. Select "Remove" on the current cover image, then select "Upload image" to pick an image from your computer or another location online. Upload your desired course cover to replace the default image and save. 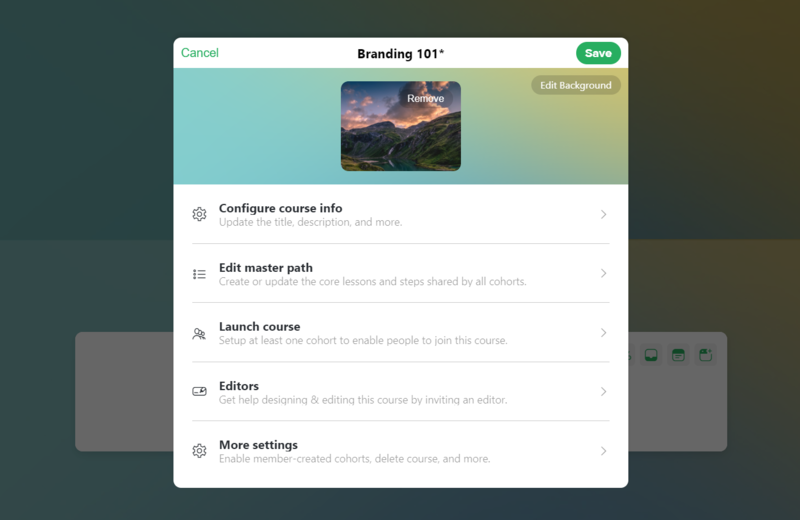 Your course was generated with a colorful default cover on the outside, and matching banner and background on the Path inside. 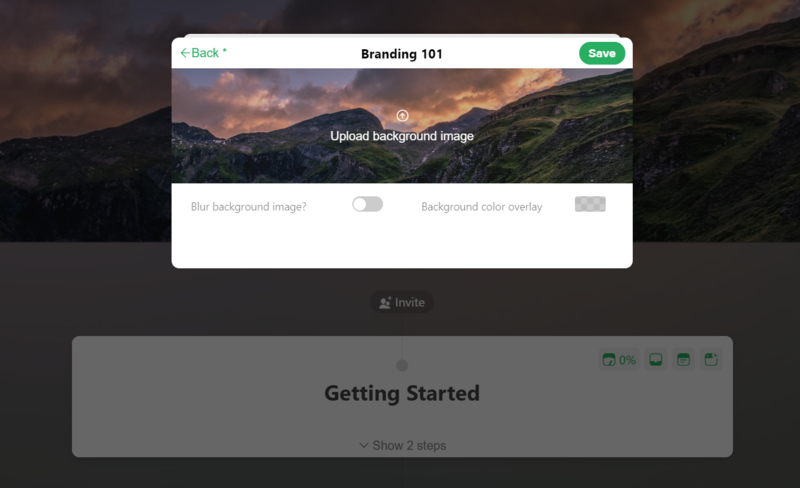 Here's how to update the Path, where your learners will spend most of their time, with your own brand appropriate image or color. Select "Edit background" then "Upload background image" to replace the default background or previous image. Save, then edit as desired. You can add or remove the blur setting and optionally use the color overlay to add a solid or semi-transparent color. This can be used to tint or darken your image, so text shows up with better contrast. 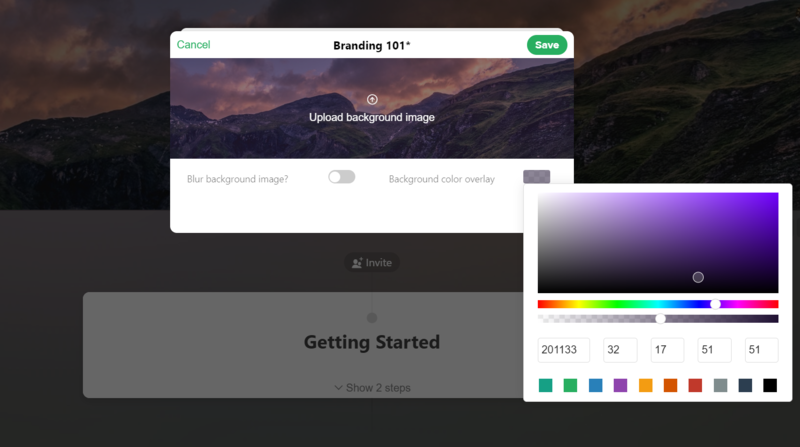 To use a solid-color overlay, pull the transparency slider all the way to the right. To remove an overlay entirely, pull the transparency slider all the way to the left for 100% transparency. Save and exit to view your work. By the way, if you don't know where to get beautiful course cover art, we highly recommend checking out https://unsplash.com/. They have free high-resolution photos that you are able to use for your course covers and backgrounds. Can't find the right picture? You can also use a free account at https://www.canva.com/ to create custom cover art.